Here’s the “box” it came in with a few facts. Pretty cool huh? 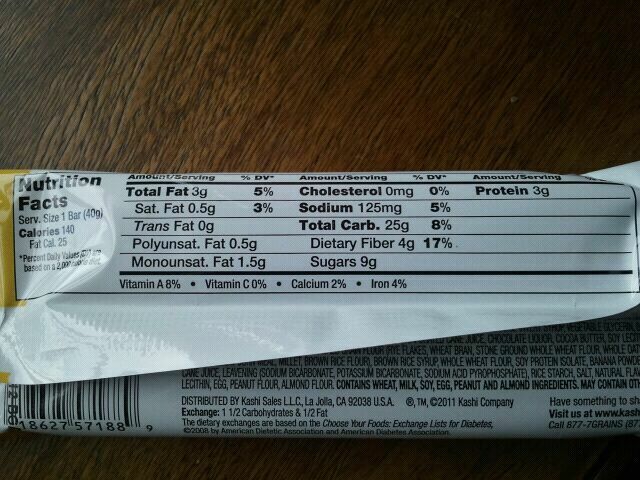 Half a serving of fruits and veggies in each bar! 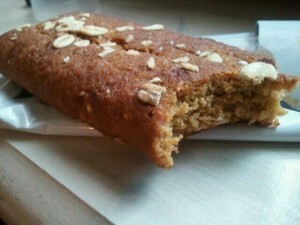 I decided to eat this one this morning before my workout with a scoop of peanut butter (obviously ; ) ). Here’s what it looked like. It was about the size of a Nutri-Grain bar, and a bit thicker width-wise. Oats sprinkled on the top, more for the eye in my opinion, as they looked nice but didn’t really add much flavor. The bar was super soft, like a piece of homemade banana bread. Every now and then I got something crispy/crunchy like a piece of crisp rice, but I’m not entirely sure what it was. 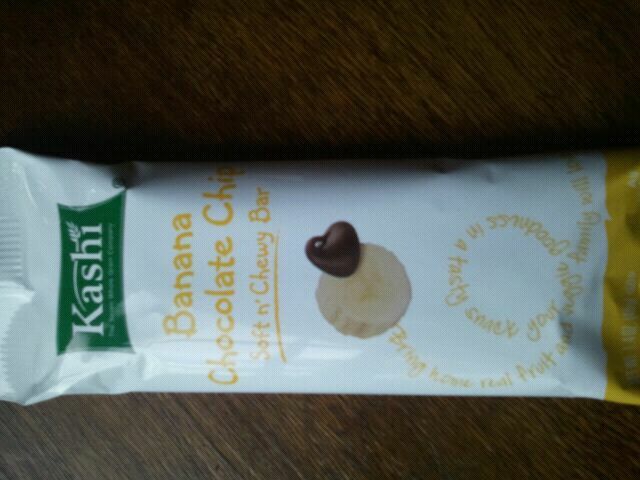 It wasn’t really that sweet, and had a mild banana flavor. I could certainly detect that it was banana, but it wasn’t screaming it or wasn’t super sweet like a standard piece of banana bread usually is. 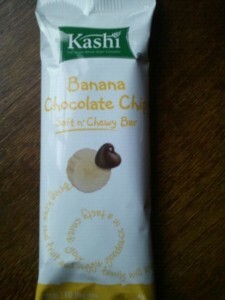 As for the “chocolate chip” aspect of the bar. Uh…… what chocolate chips?? There were about 3 chocolate chips in the entire bar which was really a let down. They didn’t provide much flavor, but was a teeny bit of a surprise every now and then, but really, I only counted 3. The bar was sort of lackluster though. I was 3/4 of the way done and I grew really bored of the bar and wished it was over. Not to say it was bad, but it wasn’t really amazing or all that great either. It was average, and I wish it was a bit sweeter. Overall, 2.5 stars. I like the veggie/fruit serving aspect, and I also like the fiber and that it’s relatively low in calories (140 calories). It did provide me with stable energy during my workout which also was a plus. However, I don’t know if I would buy it in the future. 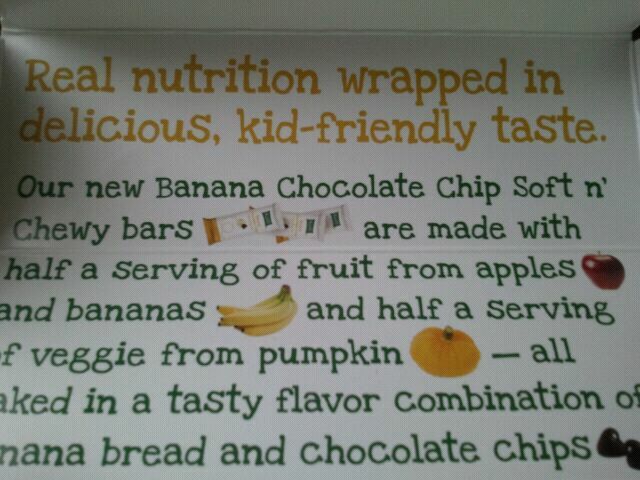 And now I really just want to eat a slice of banana bread. hmmm…. 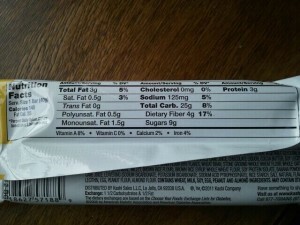 it’s too bad that you didn’t like the bar more – i much prefer chewy and crunchy to soft in my bars! it’s all about the texture!